From Singapore – All public buses from Singapore will pass through Johor custom. Exit at Johor custom and go to the bus station at Johor Sentral. This building is connected to Johor Custom. Take public bus to Kota Tinggi from Johor Sentral and alight at Taman Daiman Jaya. The journey takes about 1 hour (Ticket RM4.80). You will see a restaurant on the right side just before the sign ‘Taman Daiman Jaya’ on the left side. The sign boards have picture of big horse (Da Ma). Ask the bus driver to stop you at this junction when you purchase the ticket. From the junction, you will need to walk for about 5 minutes to Percint Intan. Turn to the first road right after the security guard. From Singapore – There are a number of taxis that go to Johor Sentral. The taxis from Rochor Road normally does not stop at Johor Sentral. They only stop at Kota Raya. Some drivers, such as Mr Wong, 96630085 may arrange pick-up service from any address in Singapore. From Johor Sentral Taxi Stand – Many taxis are available at the taxi stand of Johor Sentral. Guests need to first buy taxi coupons at the taxi stand booth prior travelling. The cost to travel to Home of Peace, Kota Tinggi is not more than RM60 per trip. It is best to avoid taking any taxi that refuses to use its meter. Therefore, getting a cab and paying the driver through the taxi management booth is the safest approach. Home of Peace is planning to offer a pick-up service for its guests (maximum 4 only) at Johor Sentral on Friday night or Saturday morning, and return on Sunday. Guests may charter the car and driving service to optimize their holidaying time. The closest international airport is Senai International Airport. 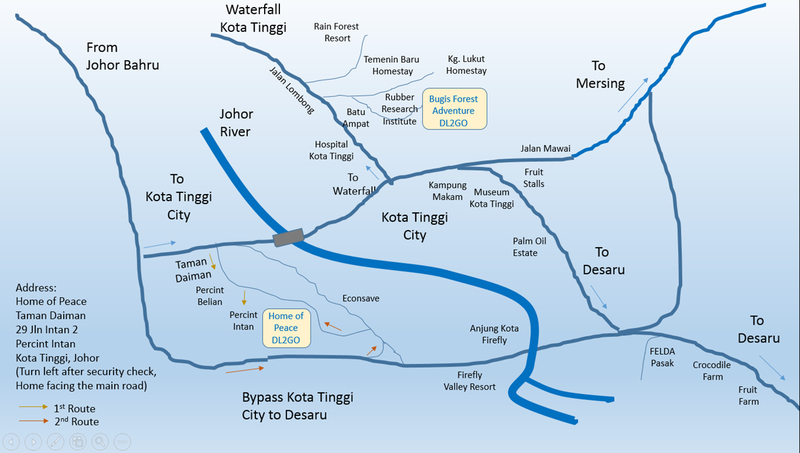 From there, you can take a taxi to go to Kota Tinggi (RM80) or go to Johor Baru with airport express bus. You can take a cab from Johor Baru to Kota Tinggi (RM70). Another closest international airport is Changi Airport, Singapore. From there, you may take taxi or express bus to Malaysia. Then continue your journeys with other means of transportation.